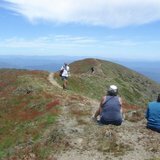 Being the second highest mountain in Victoria, many people may assume that climbing Mt. Feathertop would be beyond them. However in summer the breathtakingly picturesque summit of Mt. Feathertop is accessible for a moderately fit person (or child from about 12 up). Walking Mt. Feathertop is a great and very satisfying activity for a weekend away from Melbourne. (In winter, Mt. Feathertop should only be attempted by very experienced skiers and climbers). Mt. Feathertop is located in North Eastern Victoria, just under 4 hours' drive from Melbourne. With a little bit of organization, the walk can be done as part of a standard weekend. Before and after the walk accommodation options range from camping to cabins to luxurious in the gorgeous, little towns that are scattered around Mt. Feathertop such as Harrietville, Porepunkah or Bright. Harrietville is the closest town for the Feathertop walk but there are plenty of others in the area that are convenient. Main access to Mt. 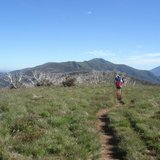 Feathertop is via two different trails, each very beautiful within its own right. The first is the Razor Back. The Razor Back is a gently undulating trail that traverses from Dimantina Hut, on the road up to Mt. Hotham, across to Federation Hut, just below the beginning of the ascent to Mt. Feathertop. The Razor Back trail only occasionally dips below the tree line and on a clear day affords beautiful, 360 views across the mountains and the valleys that make up North Eastern Victoria. During late spring and summer walkers are treated to an amazing array of native wild flowers carpeting the slopes either side of the Razor Back, making the walk very scenic. To access the Razor Back, follow the signs to Mt. Hotham on the Great Alpine Highway from Harrietville. The Bugalow Spur track is named after a Bungalow that provided accommodation, ski hire and food to skiers from 1925 until it was destroyed in the catastrophic bushfires of 1939. Skiers made the ascent either by foot or horse back and then spent time indulging in skiing around Mt. 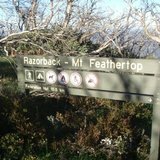 Feathertop and the Razor Back. Charred ruins of the bungalow are just visible and make good food for thought - comparing Victorian skiers and ski conditions in the early 20th century to those of the early 21st. Aside from its historical significance, the Bungalow Spur is a very pretty trail that takes walkers through many "layers" of vegetation as it ascends from the town of Harrietville in the Ovens Valley to Mt. Feathertop. Access to the Bungalow Spur trail is left off the Great Alpine Road at Harrietville (just before the school bridge over the Ovens River). Follow the road for 0.5 km to the parking area. To climb Mt. Feathertop you have three options: go across and back via the Razor Back Trail; go up and down via the Bungalow Spur Trail; or a combination of both trails. To do the combination, you'll need to have two cars in order to "shuffle" walkers from the end of the respective trails. If doing the shuffle, I recommend going across on the Razor Back and then down Bungalow Spur (this is because I dislike walking "up" hills. If you – or your knees! – prefer to walk up than down, then you may wish to reverse this order.) This article assumes you are doing the Razor Back –Bungalow Spur Shuffle, but you'll be able to easily use the information to organise a very enjoyable walk regardless of which option you choose. To begin your walk, drive up the Mt. Hotham Road from Harrietville. Approximately 3kms before you reach Hotham Village you will notice the Dimantina Hut and the beginning of the Razor Back trail on your left. The 11kms from Dimantina Hut to Federation Hut will take about 4 hours (including stops for snacks and photos). Federation Hut is a campers' hut rebuilt on the site of what was once a cattleman's hut. As far as huts go it is well kitted out and clean and is accompanied by an eco toilet – the only toilet you'll encounter on the walk. The flat, grassy area around Federation Hut makes a lovely picnic spot for lunch. Generally I eat my lunch before beginning the steep ascent up Mt. Feathertop to give myself some energy. Any backpacks can be left at Federation Hut while you make the ascent. The ascent up Mt. Feathertop is not long distance wise, but it is very steep. The amazing views and the sense of achievement make it well worth the effort. When I did this for the first time as an 11 year old my father coaxed me up by giving me a piece of chocolate every 50 steps – I still use this method on myself if feeling a bit weary on this steep climb. After the ascent to Mt. Feathertop you will return to Federation Hut. Here, take the opportunity to rest again before beginning your descent down the Bungalow Spur. Although steep, the Bungalow Spur was originally created for horses and has a manageable gradient. Almost immediately you will notice a change in vegetation as you drop below the tree line. The changes in vegetation provide a lovely accompaniment to your walk down to the Harrietville car park. Another great option for climbing Mt. Feathertop is to make it a two-day walk, camping at Federation Hut for the night (no permits required). If taking this option, do not assume there will be room in Federation Hut, it is extremely popular and can get busy so bring all your own camping equipment. If taking children, this should not be the first walk they do – there is no option to phone a friend to come and pick you up. Build children up to the walk. Take them on equivalent length day walks to ensure they'll have sufficient stamina and interest for the walk. Start them off carrying a light pack. Make sure there is room for all their gear in your pack, so that if they get tired you can relieve them of the load. As always, let someone know before you go and carry additional clothing: the weather at Mt. Feathertop and all across the Razor Back is unpredictable - flurries of snow in the middle of summer are not uncommon. Finally, be respectful of the area. Take only photos and leave only footprints. It is an EVIL MYTH that apple cores, banana skins, etc can be thrown into the bush – they are not native to Australia, take ages to decompose and look awful. Quite simply, they have no place in a national park. Bring your own toilet paper (the eco loo at Federation Hut has been known to run out). Carry a spare freezer bag to store any that is used en route – used toilet paper (even buried) has even less place in a national park than do apple cores and so forth. Why? An enjoyable walk with stunning scenary. Cost: no walking or camping permits required. Petrol, accomodation and food costs will apply.